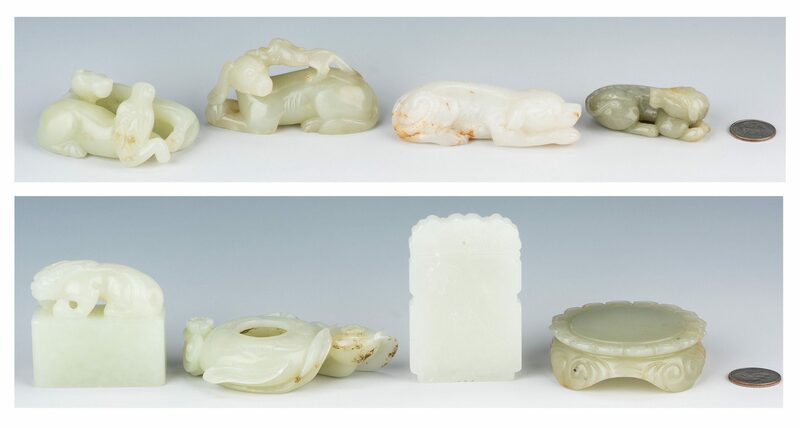 Eight (8) Chinese Carved Jade Items, including Animals. 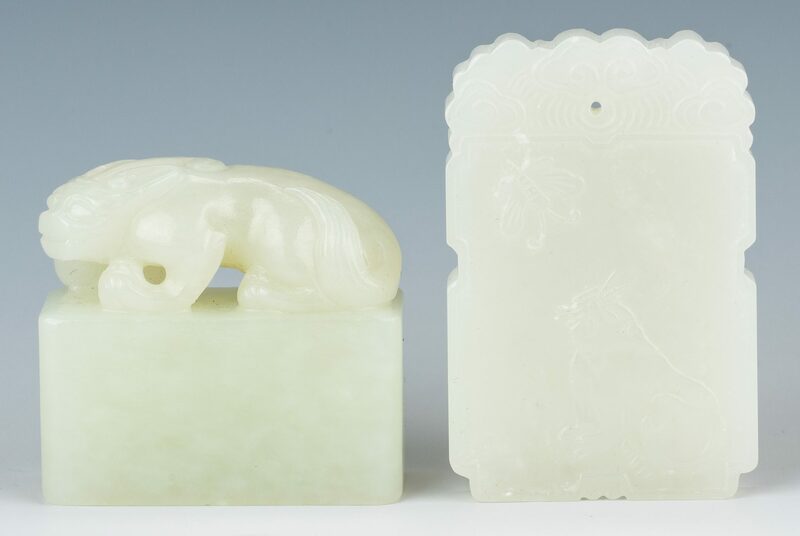 1st item: Carved white jade figure of reclining dog with head resting on front paws, with russet inclusions at base. 3" L. 2nd item: Carved light celadon green jade reclining mother dog with long ears and puppy on her back, 2 3/4" L. 3rd item: Small carved jade or jadeite reclining dog with head turned back, ribs and spine showing, 2" L. 4th item: Carved light celadon green jade figural of two reclining horses at play, 2 1/2" L. All 4 items Chinese, late 19th century. 5th item: Carved light celadon brush washer with two compartments, fruit and floral cluster, small areas of russet inclusions, 3/4" x 3" x 1 7/8". Chinese, late 19th/early 20th century. 6th item: Carved light celadon plaque, one side with cat looking up at butterfly, other side of bird perched in flowering branch. Carved clouds at top with small hole in center, 2 1/4" x 1 1/2" x 5/16" D. Chinese, late 19th/early 20th century. 7th item: Carved light celadon green brush washer, shaped edge of cloud design with carved lotus leaf base, 5/8" H x 2 1/4" W. Chinese, early 20th century. 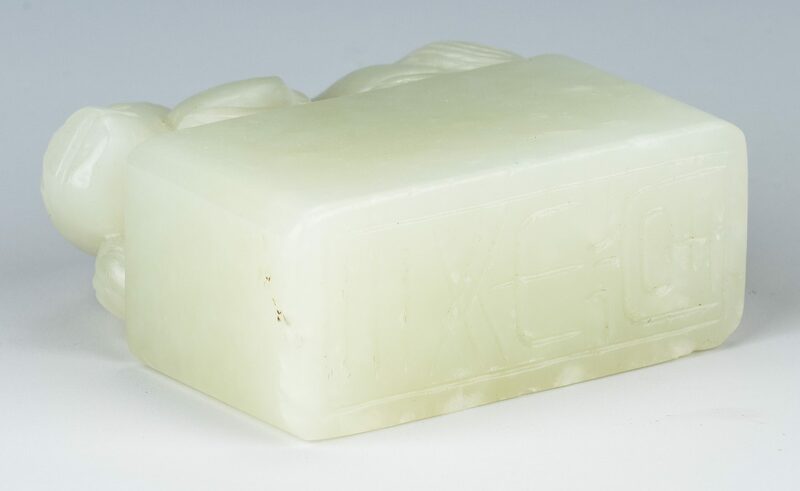 8th item: Carved light celadon green rectangular seal with foo dog on top and characters on base, 1 5/8" H x 1 3/4" W x 3/4" D. Chinese, mid/late 20th century. CONDITION: 1st-4th items in very good condition with no visible losses. 5th item: 2 to 3 fleabites of wear to rim areas. 6th item: Minor areas of russet inclusions. 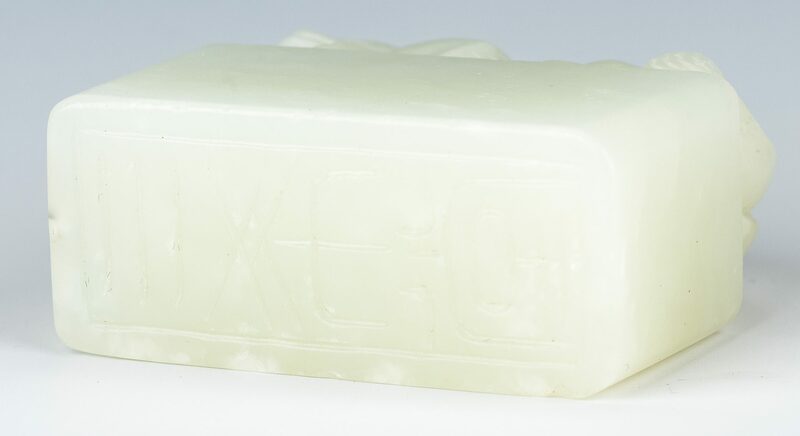 7th item: Minor wear to base. Otherwise good condition.